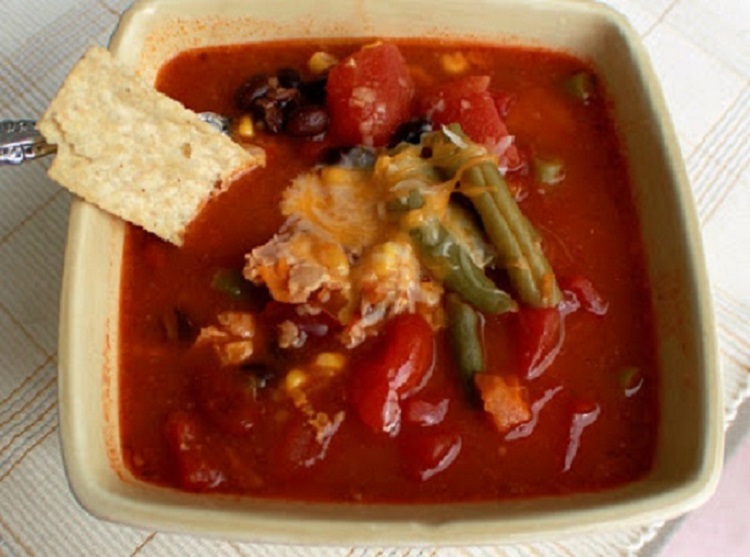 Seriously if you can use all fresh vegetables, this is the best Southwest Chili, so easy to make with robust flavors. This is the quick version but I prefer to use all fresh beans and vegetables A great chili or soup recipe, see at the end the versions. Your going to love this recipe! Combine all the ingredients in a large saucepan or soup pot over medium heat. Chop the corn tortillas into small pieces with a food processor or sharp knife then add them to the the soup. Bring to a boil, then reduce the heat and simmer for 45 minutes to an hour, or until the chili has thickened and tortilla pieces have dissolved, for the most part. Serve chili in a bowl, topped with a garnish and heaping tablespoon of the shredded cheese over the top of the soup, crumbled tortilla chips over the cheese and a dollop of sour cream. If you prefer this as a soup, add 5 more cups of chicken broth, serve as a soup. This does look like something I would enjoy! I like the round up of the veggies in this soup. Canned is a quick way to go, but fresh is the best way to go when you have time. Happy Friday! I know this soup is good, because I make one just like it but without the tortillas. So good on a cold winter day. Your soup looks perfect for the snowy day that's coming our way again! Love all the veggies and garnishes. Love that you used beans in this soup. Lovely recipe, the beans combine well with this. Something new for me today. Thanks! Have a great weekend! Sounds like a spicy and flavorful soup. I have everything in my pantry to make it. Sounds wonderful, Claudia! I love these SW flavors in soup...yummy! I love soups like this. Quick, easy, nutritious and delicious! Perfect soup to toss together when you're late getting home from work and don't feel like slaving over the stove. Thanks for sharing. I am really salivating while watching this. LOL! I could imagine the taste! Whew! Just to divert my drolling, me, my wife and kiddo ordered pizza hut. Anyway, it still has tomatoes in it. hahaha... Will keep visiting your site to read great Italian recipes. Cheers! Mmm, this sounds like my kind of hearty soup packed with flavor :) Love it! I love this soup! So easy to prepare too!